The Dummy – and how to get rid of it! 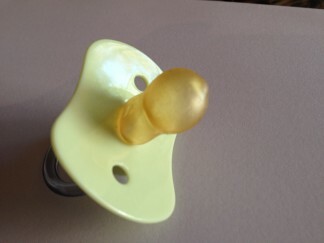 A dummy is often used to help a child go sleep or as a pacifier. An anatomical dummy is usually better suited to the shape of the mouth. However there are few things that need to be avoided with dummies. 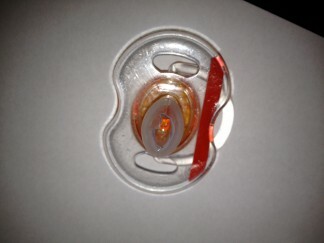 Do not put the dummy into your mouth then into your baby – it’s dirty! They will inherit your bacteria and any infections you have AND visa versa. This is not the time to share the love. A family can get very sick very quickly. NEVER PUT ANY SUGARY SUBSTANCES ON THE DUMMY. This is a recipe for dental and dietary disaster. The bub will crave for sugar and will have decay in their new teeth to show for it! Prolonged use of dummies can lead to the same problems as thumb sucking. This includes a misshapen upper jaw, open bite with the front teeth, mouth breathing, speech and swallowing problems. If the habit is stopped early enough then the child’s growth can often correct the effects of a dummy. The earlier it is removed the better. The very latest is 5 years old but even then is habit that has to broken i.e before the permanent teeth appear. 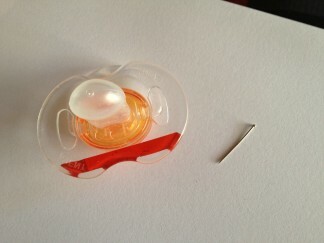 The advantage of a dummy used for getting a baby to sleep is that it can be removed. A thumb is a bit more difficult. Get four or five dummies. Pierce a hole in one dummy with a pin. The next dummy pierce more holes. Then the third dummy bigger holes. The fourth dummy bigger holes then the final dummy cut the top of it (as shown in the final photo). Give the baby the first dummy. 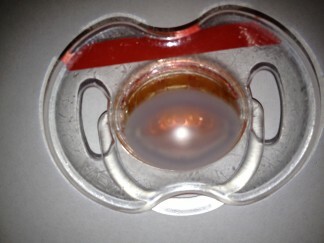 When the baby finds the suction is not as good, and throws it away then give him/her the next dummy with more holes. And repeat the process till the final dummy which has no suction. By this stage the baby will be frustrated with the use of a dummy. Then if all goes well, bye bye dummy!